On June 24, 1942, the Manuela was Northbound from San Juan, Puerto Rico, to New York City carrying 26,000 bags of raw sugar and 75,000 bags of refined sugar, a total of 6,401 tons of a product that was badly needed during this time of World War II. The ship was in convoy with eleven other merchant ships that were being escorted by several warships. When the convoy reached a position about 75 miles East of Cape Lookout, NC, they were sighted by Kapitanlieutenant Otto Von Bulow, Commander of the German submarine U-404. Von Bulow was able to maneuver the U boat into a very good attack position against the convoy due the slow 7 knots speed of advance the surface ships were making. The U boat crew fired a salvo of torpedoes in a spread at the ships of the convoy. The first hit was the Panamanian freighter Nordal, traveling in the starboard column of the convoy and the nearest to the U boat. When the torpedo exploded against the Nordal, there was no doubt for the other Captains in the convoy as to what had occurred. They broke ranks and began steaming in various directions in order to avoid the unseen enemy. Captain Nilsen of the Manuela was no exception and he ordered up full speed ahead and began to make sharp turns to attempt to evade the U boat assault. Unfortunately Captain Nilsen's efforts and course changes lead him directly into the path of Von Bulow's second torpedo. The Manuela was struck on the starboard side amidships at the bulkhead between the engine and boiler rooms tearing these compartments open to the seas. Two men on duty in the engine room spaces were killed instantly, Willis E. Camp (Oiler) and William H. Holmes (1st Engineer). The Manuela flooded fast and took on a list to starboard. She was doomed and Captain Nilsen knew this, so he immediately ordered an abandon ship. The starboard lifeboat had been obliterated in the explosion so the 34 Merchant Men and 6 Naval Armed Guards used the port side lifeboat and several rafts to escape the vessel. By the time they were able to launch the boats, the deck was awash to the hatches and the ship listed heavy to starboard; it was about to go down at any moment. Fortunately for fireman Antonia Figuerosa the ship did not sink right away, but miraculously continued to float. Figuerosa had also been on duty below decks and severely injured during the attack. When Figuerosa regained consciousness he found himself alone on the sinking ship. Figuerosa dragged himself up onto the open deck in spite of having compound fractures to his left arm and right leg. He lay upon the open deck until the next day when he was spotted by crew members from the Coast Guard Cutter CGC-252 who rescued him from the Manuela and certain death if the ship had gone down. The Manuela refused to give up and go to the bottom so the rescue tug P.F.Martin began the process of towing the vessel to Morehead City or at least the shoal waters of Cape Lookout. The tow was difficult and the tug struggled to move the large, mostly sunken, Manuela to safety. 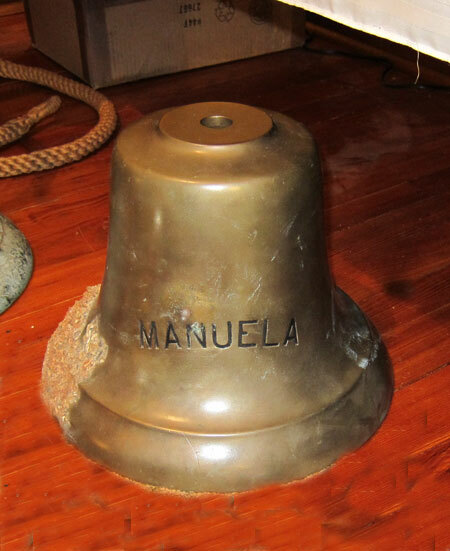 The tow attempt lasted about 24 hours before the ocean won and took the Manuela to the bottom on June 25, 1942. It is a long trip out to the Manuela, passing the excellent wreck sites of the Dixie Arrow, Proteus and Tarpon along the way. Knowing that you have another ten miles to travel once at the Proteus makes it tempting to just stop there and go diving. But as great a dive as the Proteus is, the Manuela has an attraction for many divers that these other sites just don't match. Being far from shore and deeper, the Manuela is most often in very clear waters with visibilities rarely ever being less than 50 feet and usually in the 100+ range. 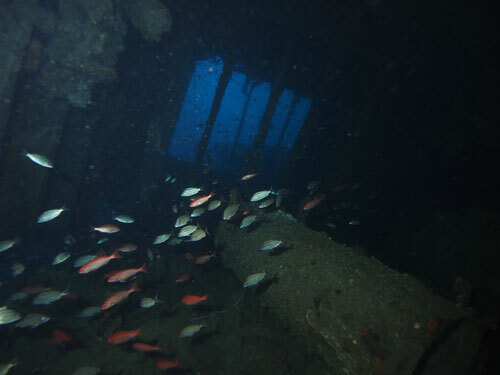 The deep water has also prevented much of the storm damage that is present at shallower sites, leaving major sections of the wreck relatively intact and very identifiable. This creates a very impressive backdrop to the large numbers of big fish that inhabit the site. Some of the largest groupers, snappers and even huge lionfish can be found here on a routine basis. The ship is broken into three major sections that all lay in a slight crescent shape with a large debris field scattered to the inside of the crescent's arc. All three of the big sections of wreckage are on their starboard sides and though the gunnels are buried many feet into the sand the wreck rises 25 to 30 feet from the bottom along most of it's length. 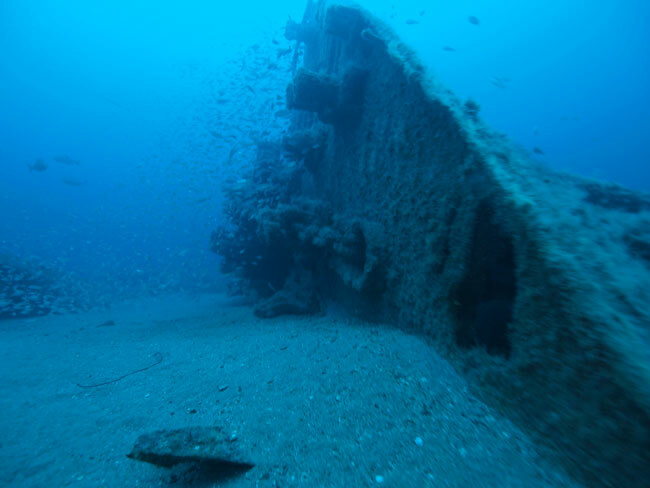 The center section of the wreck appears to be the largest piece with the highest relief and is laying so far on it's side the bilge keel is almost pointing skyward. This area contains a empty cargo hold and the machinery spaces where engines and many pipes and valves hang upside down. Access to these spaces is deceptively easy and they invite exploration, but use caution. 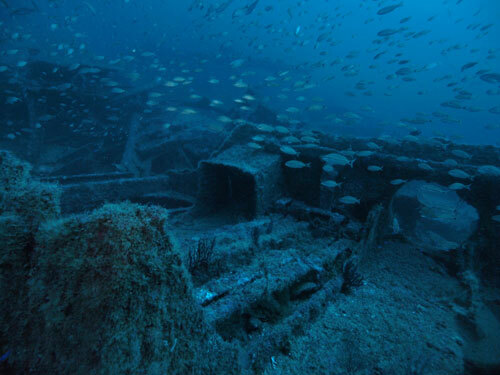 Adjacent to this area is the debris of the deckhouse and associated structures that have fallen off the main wreck and collapsed onto themselves with the amidships wheelhouse being upside down (this is the section in the picture to the right). This will become evident to divers exploring this area when they look into the wreckage and see some of the toilets and sinks still hanging overhead. Just aft of the area with the toilets is the remains of another section of deckhouse that contains several still intact portholes which from time to time are exposed, depending upon the level of sand present at the site and during my latest dives to the wreck site in 2013, I have not seen this area above the sand. 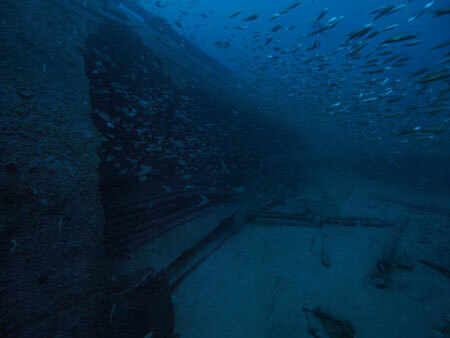 The stern section is separated from the amidships by about 30 or 40 feet but this is often not even noticed while on the bottom due to the continuing debris field that links the two sections. 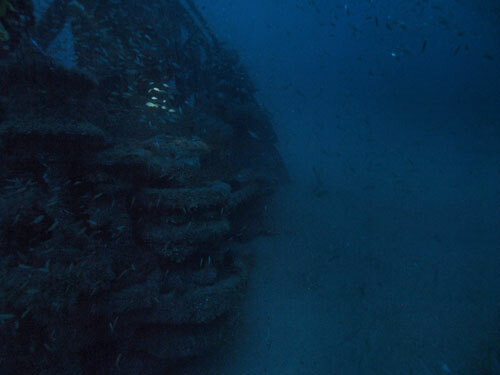 The stern remains very well defined and if you swim to the top of this hull section you can see the large prop and shaft on the bottom of the hull. The very size of the wreck site combined with the depth and short time span of the average dive here means it will take most divers many trips to the wreck get a good idea of the layout and structure of the site. It has taken me many dives as well. On most dives I do not venture more than a short distance from the anchor as I get involved in examining some structure or artifact and before you know it - time to ascend. Much of my knowledge of the overall layout and how it all fits together comes from the drift over the wreck site once I pull the anchor free. "Flying" over the site on the anchor line really gives you the opportunity to see it all and how the pieces relate to one another. 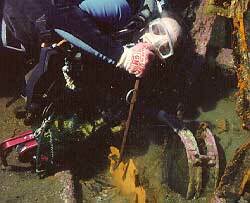 The ship's bell (pictured to the right) was recovered by Diver Gary Gentile on a dive to the bow section of the wreck. 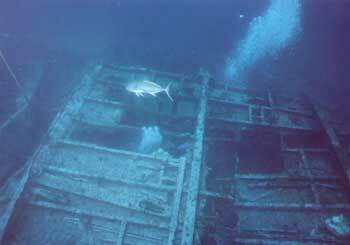 The bow of Manuela is half buried into the sand with the big anchor winch the prominent feature. Marc Corbett photo. Photo by Marc Corbett, shows the Amidships section of the hull with the large opening into the engine room area, swim right in but be careful. Inside the Manuela engine room area, not far from the opening. Marc Corbett photo taken in October, 2013. Marc Corbett photo taken from the engine room, looking out the deck beams, October, 2013. Dive Marc Corbett took this photo of the debris that lays near the bow section during a dive in October of 2013. 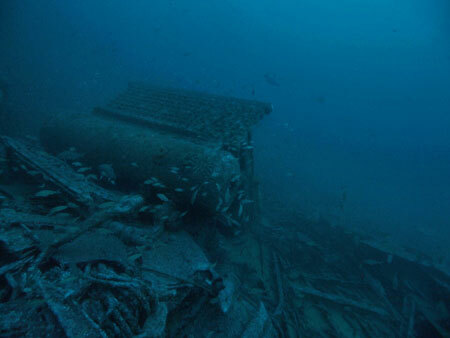 The debris field runs almost the full length of the wreck, but all on what was the starboard side of the ship. Debris just outside the engine room includes this large condenser and myriad other components that once powered the ship. Marc Corbett photo. Another Marc Corbett Photo of the bow, this time you are looking aft from the very tip of the bow. The bow is on the Starboard side half buried in the sand. 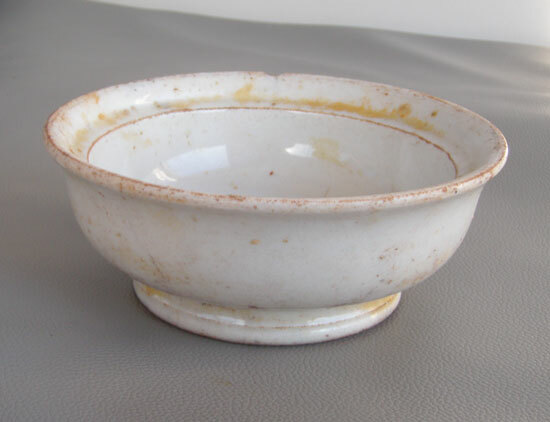 This china bowl was recovered from Manuela Oct of 2011 by diver Charlie Bulloss, one of several nice artifacts he has recovered from this site. 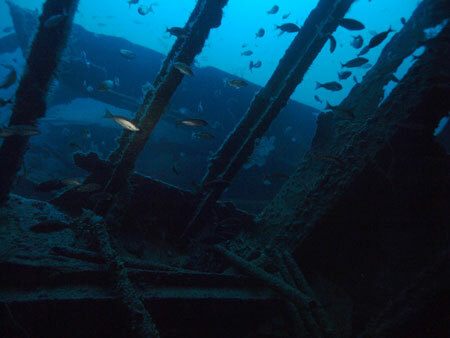 Paul Hudy has some excellent photographs of the Manuela posted on his BFDC NC wreck diving site that you should take a look at. They show the Manuela as you can experience her, if you have the experience to go deep and enjoy it.